When Boris Johnson was re-elected mayor ten months ago, he promised to dedicate himself to London and to Londoners. But today he's being accused of shirking that duty by devolving his power to his staff. There are complaints that he's not taking his job seriously. Simon Harris reports. London mayor Boris Johnson is at the centre of a new row about whether he works hard enough. Opposition politicians on the London Assembly have accused him of abdicating responsibility for important decisions. The mayor has changed the rules to give unelected officials a greater say at City Hall. He has to approve any decision which involves spending above £50,000 but the threshold is now being raised to £125,000. Labour's Len Duvall said: "Boris's attention seems to be increasingly elsewhere." Boris Johnson has previously come under fire from his critics for accepting a £250,000 a year contract to write a weekly column for the Daily Telegraph. The mayor was speaking at a property conference on the French Riviera this lunchtime and was unavailable for comment. London mayor Boris Johnson has been criticised for relaxing City Hall's spending rules. London is already outperforming the rest of the UK in educational standards but Boris wants to make the capital's schools world class. London Mayor Boris Johnson says that even though London schools have improved, they need to get even better to compete with the ever improving standards around the world. Lord Mayor Boris Johnson is visiting an academy in Pimlico today, after announcing he wants to see more free schools at the Conservative Party Conference. The Mayor says he has plans to unveil which will make the capital a world leader in education. Olympic star Mo Farah and Boris Johnson visited a school in the capital to demand changes in policy to help tackle physical inactivity. 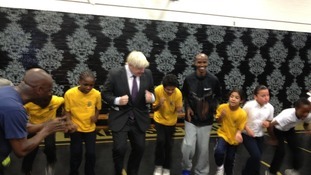 Mayor Boris Johnson and Gold medallist Mo Farah have launched a campaign to get children active. London Mayor Boris Johnson has apologised to London businesses whose trade was hit by the Olympics.